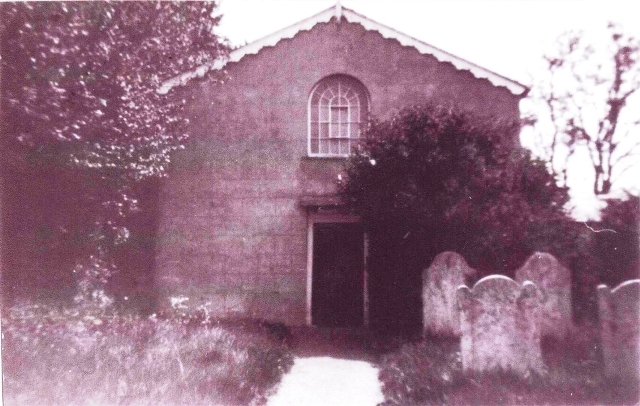 This year  Walkern URC is celebrating the 200th anniversary of the Church being dedicated for worship. Over the next month, and indeed over the next year, we will be marking this very special anniversary. After the passing of the Act of Toleration in 1689, dissenters were allowed to have separate places of worship, and to choose their own Pastor, but all buildings had to be registered with the diocesan bishop (i.e. of the Church of England). The earliest recorded date for this in Walkern is December 1699, when a congregation met in the house of one Edward Ives. Various houses and barns were used as meeting places until, on 1 May 1810 the present building, owned by the Bulwar Lytton family of Knebworth, was opened for worship. 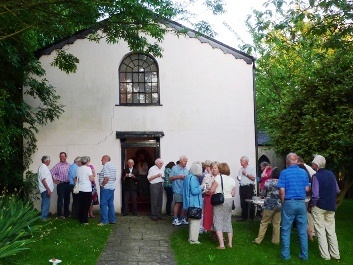 A year later the congregation was formed into a church. April 29th 1811. This day by the divine permission, the Revd Mr Towne of Royston, and the Revd Mr Masler of Hertford met for the purpose of forming into Church order, those who had profest faith in the Lord Jesus Christ, who were anxious to be more closely in the bonds of Christian affection. 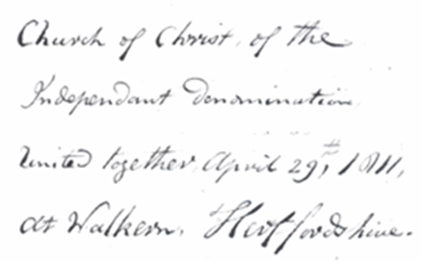 Extract from the Church Book: "Church of Christ of the Independant Denomination United together April 29th 1811 at Walkern, Hertfordshire." Mr Towne in the most scriptural manner enquired of the friends in the vestry, the foundation of their hope and what the Lord haddone for them – After which he went to prayer in the chapel – This being ended Mr Wm Baron was chosen as a proper person to converse with – Mr Towne enquired more explicitly respecting his experience of the things of God and of his evidence of being called from a state of natures darkness, to the Light of the Gospel. Having received satisfactory answers, Mr Towne by consent of Mr Masler, gave him the Right hand of fellowship. – the same proceedings were observed in the admission of the following persons. – Mr John Martin, Mr James Thomson, Mr Wm Ball, Mr Edward Wright, Mrs Peters, Mrs Ball, Mrs Ann Holiday, Mr Joseph Peters produced his letter of Dismission from the Church at Whitwell where he was also received a member, after which the Revd Mr Masler proposed Mr Jas Edward Miles as a member of the church which was also agreed to, and he was received by friends as a member, after which Mr W Baron was chosen Deacon of the Church. The advice given was scriptural and affectionate and was like broadcast on the waters, was found after many days – The solemn services were closed with prayer and praise. 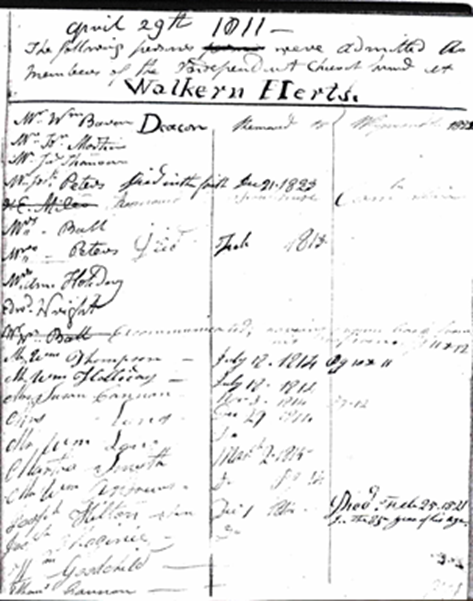 The list of attendees at that first service in 1811 are in the Church Book, (see below) and notes have been appended to some of these names allowing us a glimpse of what happened next: The Deacon, William Baron, removed to Wymondely in 1822; JE Miles removed to Stevenage; Joseph Peters ?died with faith Dec 21 1823?. Tantalisingly, Mr William Ball, whose name was later crossed out, has ?excommunicated? written next to it. Sadly the reason for his excommunication cannot be easily deciphered, if we find out more we?ll let you know, though we do know that William Ball died in 1823 aged 66 and was buried at St Mary?s.